Higher Perspective | Let me guess, someone you’re close to sleeps in until 11am and stays up until 2am. They probably come off as pretty lazy, but according to science, you couldn’t be further from the truth. Research published in the Huffington Post says that people who deviate from a normal sleep schedule tend to be more intelligent. The finding is supported by a wealth of research that suggests that people who create new evolutionary patterns, like sleep patters, are the most progressive and intelligent. In a way, it makes sense. Those who are the first to change tend to be the most progressive and intelligent. Researchers analyzed the sleeping patterns of 1,000 students and found that those who stayed up later and went to bed later scored higher on inductive reasoning tests. These tests placed the students with above normal average intelligence. 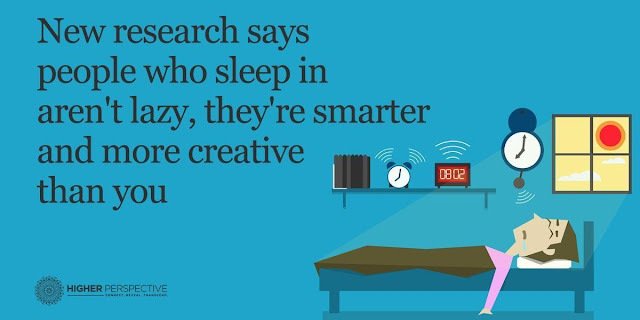 It’s true, early birds do tend to be more productive than us sleeping in types, but we late risers are better suited for creative pursuits. Many early risers do things like go to the gym or get to work early, but late night people take advantage of the night more effectively.